Sheep on the streets of Madrid. Sheep in Madrid!! Four-footed critters, baaah-ing, barking, or plodding along in front of carts; high stepping horses with fancy-dressed riders (sometimes sharing a bota wineskin); visiting rural people in traditional dress, strutting along in wooden clogs, waving enormous pennants, playing bagpipes (yes yes yes, bagpipes in Spain! ), castanets, conch shells, getting their photo op in front of traditional Madrid sights like the Cathedral or the Puerta de Alcalá. Watch closely and you may spot someone in traditional dress on a donkey or horse – talking on a cell phone! All the two-legged have a great time: the visitors enjoying a day in the city, and the locals enjoying a bit of the vanishing rural Spain. Except maybe the shepherds, who must suffer for their poor, stressed-out four-footed charges: baaah. Hard stuff under my hooves, people wanting to pat me or take pictures of my baby?? What is this?? Baaah. This is one of Madrid’s favorite events, and a great connection with Spain’s rural past, fun for “madrileños” – the older ones may have lived something similar, and the kids may have never seen anything like this, whether animals, traditional dress, rural kids, musicians, banners or whatever. Let’s celebrate the things that make Madrid what it is – capital of a country that has made a mind-boggling transition in 30 years. Let’s keep and care for rural traditions. 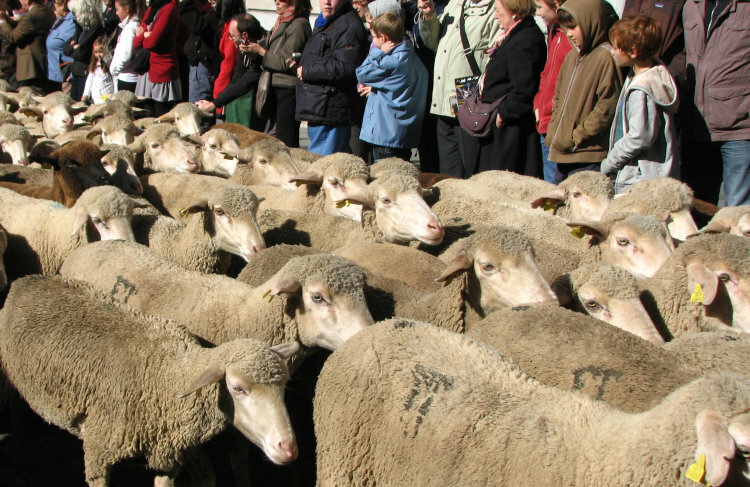 And let’s continue Madrid’s yearly celebration, in the authentic, organized by sheep-people way! Baaah! Check out the route before, at least on a map. That way you’ll know the back streets and can dart ahead or back to see different parts – or get away if you need to. Sidewalks will be packed, and street is mostly for the parade. Excellent pre-event spot: corner Bailen and Mayor, where the regional groups usually hang out waiting for the sheep to come up the hill behind the Cathedral. Leave your car at home. Or at least, leave it far away. Plaza de España parking lot might be a good choice. Plan for some delays. The sheep and other animals don’t always follow human scheduling. Bring some water and snacks, especially if you are with kids. Photo ops: These are guesstimates based on previous events, may vary. See the pre-event fun while folklore groups wait for the sheep at corner Bailen and Mayor. See the sheep come up winding Cuesta de la Vega (behind Cathedral). Watch in all come together at the corner of Bailen and Mayor, then take your pick of iconic Madrid monuments (with sheep of course! ): Puerta de Sol, Metropolis building at start of Gran Via, Cibeles fountain and Centro-Centro (Old Post Office). Want to know more about Spain’s livestock trails? Click HERE for Counting Sheep blog post, includes some photos from past Madrid sheep events.